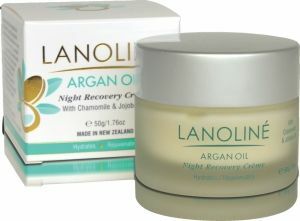 LANOLINÉ Argan Oil Night Recovery Crème gently and naturally helps restore your skin's elasticity and suppleness while smoothing fine lines. Enriched with natural Argan Oil and relaxing Chamomile and Jojoba oil, all combine to help hydrate your skin while you rest. Directions: Cleanse and dry the face. Apply to face and neck. Ingredients: Aqua, Prunus Amygdalus Dulcis (Sweet Almond) Oil, Glycerin, Cetearyl alcohol, Cyclotetrasiloxane(and)Cyclopentasiloxane, Glyceryl stearate, Argania Spinosa Kernel Oil, Simmondsia Chinensis (Jojoba) Seed Oil, Chamomilla Recutita (Matricaria) Flower Extract, Sodium Stearoyl Glutamate, Benzyl Alcohol(and)Salicylic Acid(and)Glycerin(and)Sorbic Acid, Lavandula Angustifolia (Lavender) Oil, Oenothera Biennis (Evening Primrose) Oil, Citric Acid, Stearic acid, Fragrance.